The internet made finding jobs a cinch and filling out applications simple, but getting a response — even a thanks-but-no-thanks — is another thing entirely. It’s a seller’s market: on average, corporate job openings get 250 resumes with the first one arriving within 200 seconds after a position is posted. With that in mind, we decided to dig into a database of about 7.5 million resumes to figure out if the resume format makes a difference. 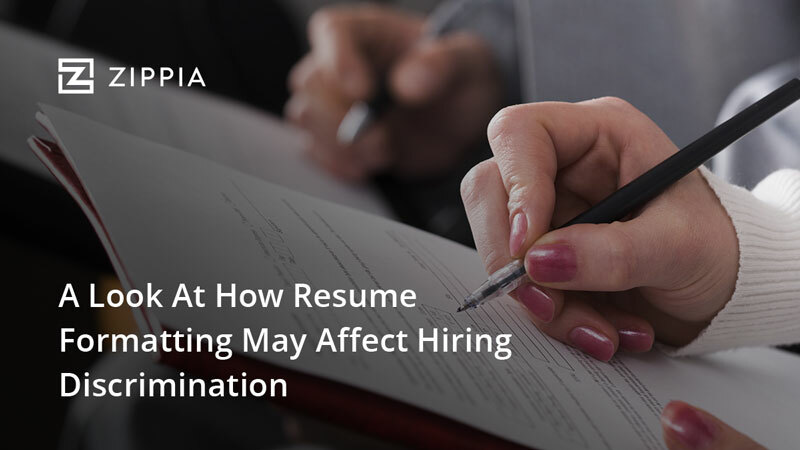 It turns out that resume format does matter, and discrimination may not just be based on the candidate’s gendered first name: hiring managers favor “masculine” resume styles over resumes with proper format and spelling. So here’s a closer look at the data and how we came to this conclusion, and why Alex might get the job, but Alexandria doesn’t. 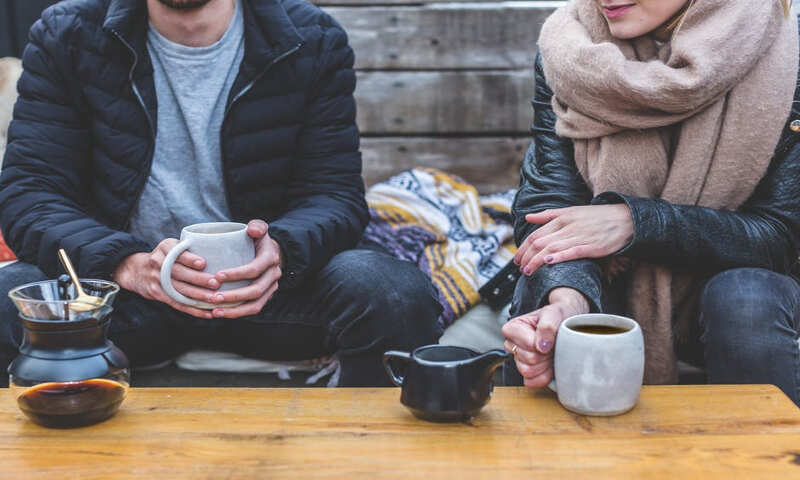 It’s unfortunate, but the recruiter is usually looking for reasons to reject you — so in this study, we first examined what’s average. One of the first things you’ll notice about our results is that while the medians are mostly the same, males usually present higher dispersions — there’s higher representation on the extremes of the distributions, while in the median and averages, females have the higher representation. One could say that men are more comfortable taking risks at the extreme ends of the spectrum and this may work in their favor, that men in this study are more comfortable challenging the resume norms than the women are. But being too far out of the ordinary is a no-no, according to most career experts. The more likely interpretation of this is that men simply are less careful, because our analysis also shows that men also make about twice as many spelling and grammatical errors as women. So men deviate from the norms and make mistakes more often. But also, observation of the parts of speech in the resumes also shows that our results are in line with this article detailing tech resumes — women’s resumes tend to be more colorful and verbose, less objective and concise. Even though women had higher character and word counts, men present more specific content than women do when it comes to providing detail about previous jobs. Men are also well over twice as likely to use bulleted lists, while women are twice as likely to use a personal statement or executive summary. Almost a third of the women had non-traditional sections like personal attributes, while 3 percent of the men did. This is important because research shows that hiring managers don’t take the five minutes they claim they do to consider you — six seconds, remember? This helps your recruiter make the most of their six seconds, finding important keywords and relevant information. An ERE study indicates that a skimmable resume improves its rating by 60 percent. A recent Fortune article relates how Erin McKelvey couldn’t get a job in the tech industry until changing the first name on her resume to the more masculine-sounding Mack. 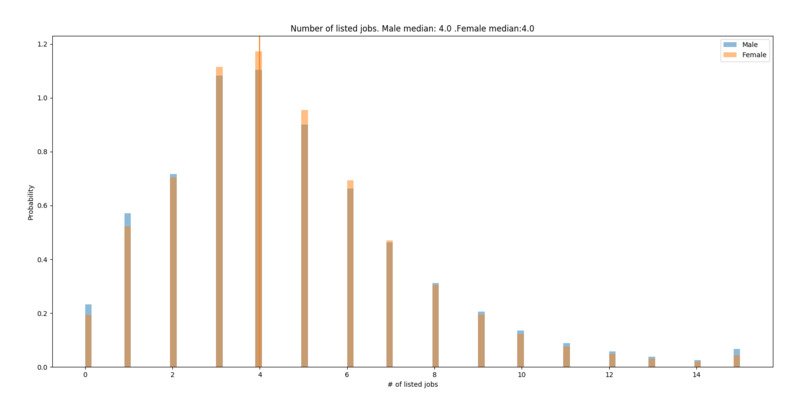 Similarly, a linguistics PhD found that when identical resumes for fictional candidates John and Jennifer are compared side by side, male and female STEM hiring managers are equally guilty of favoring John and paying him more. Experiments and anecdotes like these serve to prove that there is in fact a tendency to discriminate against feminine (and ethnic) names — but there’s also an inherent control in these two scenarios: the names changed, but the resumes’ formatting stayed the same. One method for correcting gender-based discrimination is blind hiring — removing application information that would indicate gender — in an effort to increase diversity. That is, in this case, men’s resumes were preferred over women’s even when names were removed. It’s a fact is that name discrimination — judging candidates differently based on name-based gender assumption — exists in the hiring process. Our study doesn’t contest that. Rather, this study instead suggests that traditionally feminine communicative methods and application approaches are disadvantages in the hiring process. A recent study showed that men apply for a job when they meet only 60 percent of the qualifications, but women apply only if they meet 100 percent of them. 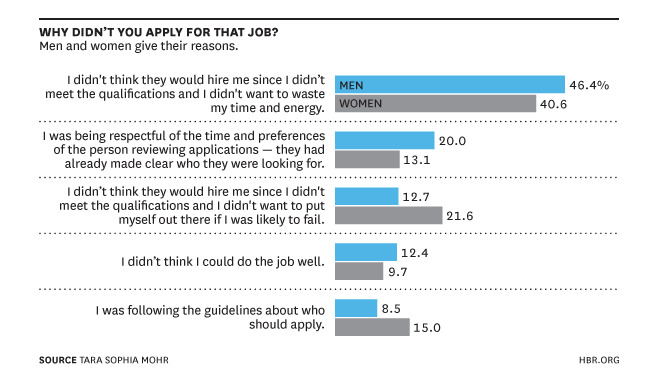 It’s telling that three factors accounting for 78% of these barriers to applying for jobs have to do with believing that the job qualifications are real requirements. What held them back from applying was not a mistaken perception about themselves, but a mistaken perception about the hiring process… women don’t need to try and find that elusive quality, “confidence,” they just need better information about how hiring processes really work. Considering the variances in resume writing styles, it may simply be that women face yet another uphill battle — what has been accepted as the norm in the HR industry is a resume writing style that predominantly favors the masculine. 61 percent of recruiters will automatically dismiss a resume because it contains typos. 43 percent of hiring managers will for spelling errors. 76 percent will for an unprofessional email address. How to define an “unprofessional” email address is a challenge, but the odds are that if you came up with it before you graduated high school then you shouldn’t use it after you graduate college. The most important thing, regardless of gender, is to pay attention to spell check and have a few people read it for a sanity check, catching phrases and lines of thought that aren’t clear to anyone but you — and as our study suggests, maybe put them in bullets too.